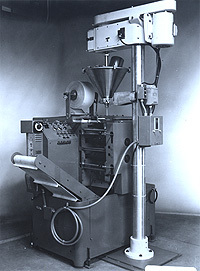 Vertical from fill seal machine designed for packaging: capsules, tablets, powders, granular products, and liquids into vapor proof flexible packaging like foil bags for medical applications. Also small medical products and parts. For exmple plastic cassettes and desiccants for diagnostic test kits. Machine cycle rates of 40 to 50 a minute. With 3 lanes total production of 150 pouches a minute is possible.